I like to try out new things, and that hasn't changed as a result of my cancer. Trying new things is good for the brain and the spirit, I believe. And who knows? I might find a new favorite while I'm exploring! 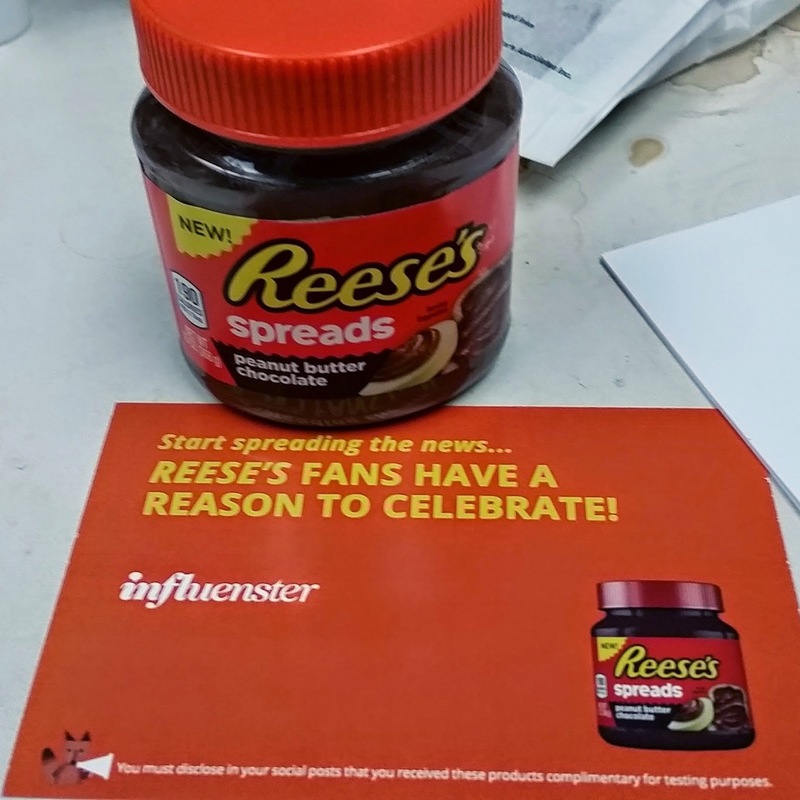 So when the folks at Influenster.com sent me a VoxBox of Reese's Spreads to try out for free and review, I was pretty excited. I love chocolate, I love peanut butter...and I love Reese's Peanut Butter Cups. I'm old enough to remember when they first showed up at candy stores. Back in the day I ate quite a few of them, reveling in that perfect chocolately-peanut butter taste. Now that I'm older, they're still a treat. But would a spread be equal to the flavor I've grown to love so much? I had to know, so I grabbed a spoon, opened the jar and dove in. And...YUMMMM!!! Perfect chocolate-peanut butter taste! It was as if I were eating one of those delicious treats. I was in chocolate-peanut butter heaven. That wasn't all. Because it's a spread, I was able to try Reese's Spreads on several other food items. Apples, pears, crackers, and pretzels--all were slathered with chocolate-peanut butter and devoured. Reese's seemed to complement everything perfectly. 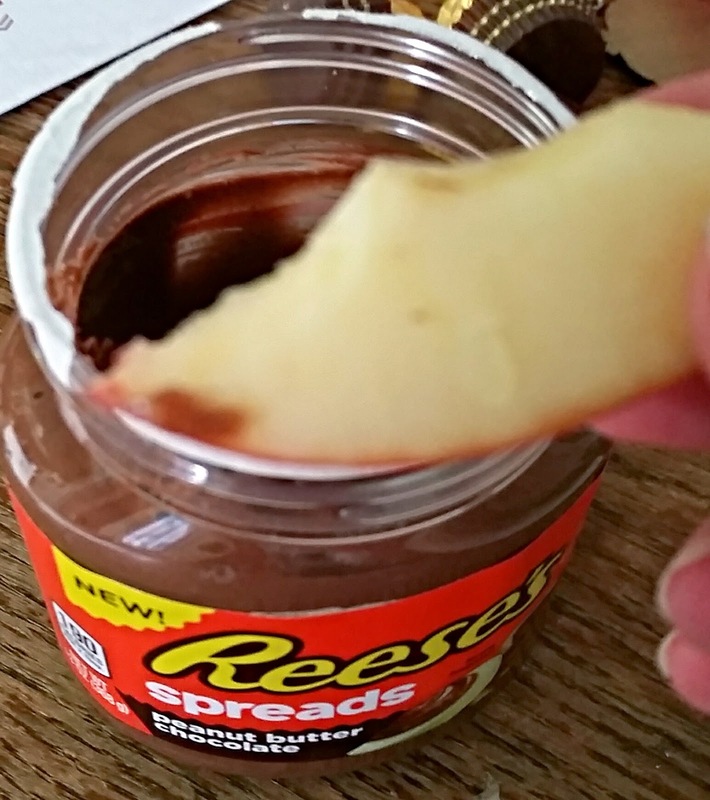 I had so much fun trying out Reese's Spreads, in fact, that the jar of delicious was gone before I knew it. I was sad until I spied Reese's Spreads sitting on a shelf in the peanut butter section of my local grocer. Naturally I had to purchase another jar. For experimental purposes, of course. That photo has a slight blur to it...was your hand moving quickly towards your mouth? I get that! Sounds like something I am eager to try...I mean stay away from...I mean try!!!! That stuff is like crack!